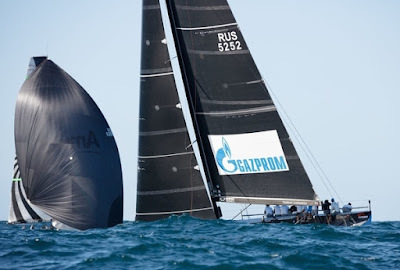 Twice in a row today Quantum Racing stuck to and executed their game plan perfectly. 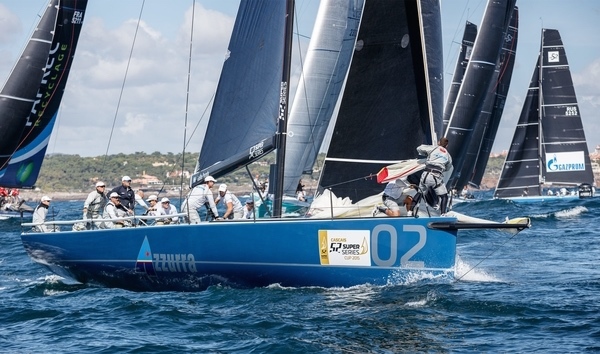 Consequently they won both races today at the Cascais Cup to take the overall regatta lead, three points ahead of Azzurra. The champions elect composed two excellent second places to keep their 2015 title chase on target. 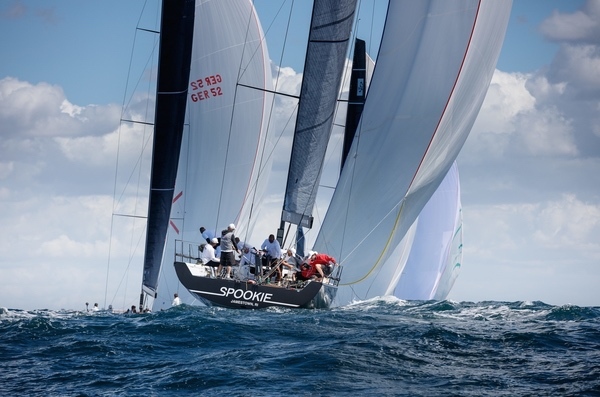 Although strong sunshine made a welcome return and added a late season sparkle to the crests of the big Atlantic rollers, the breezes remained uncharacteristically light and so the challenge for the helms and sail trimmers stayed equally acute all the way through Race 3 – a windward leeward – and Race 4 which was a short, upwind downwind Coastal Race out just around Cabo Raso and back. 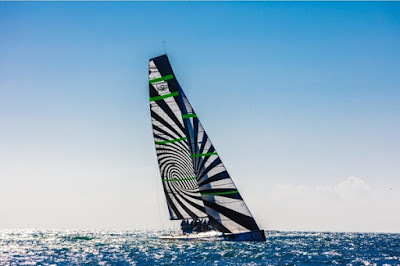 Quantum Racing were on devastating form. Page 1, Line 1 of their Thursday playbook required great starts and the ability to get right early. Ed Baird on the helm delivered nicely off both start lines and so the 2014 overall champions were able to make an early jump on the fleet. 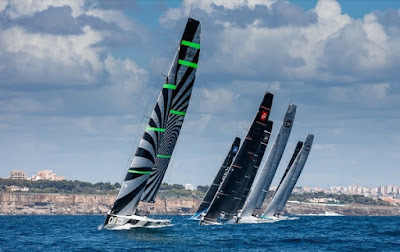 Under these testing conditions which require the teams to work in perfect harmony, in sync with the rhythm with the big waves, especially downwind, being in front affords the freedom to sail optimum angles more of the time. 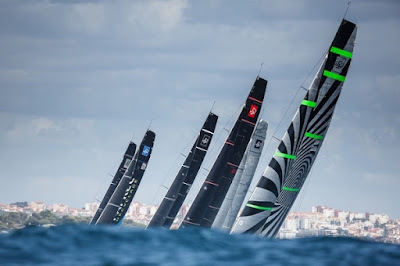 As such Quantum Racing could extend steadily and in the coastal race had equipped themselves with a margin of more than 500 metres by the time they crossed the finish line set within a couple of hundred metres of the Marina de Cascais breakwater. Tactician Ado Stead offered an insight into Quantum Racing’s downwind speed in these exacting conditions. “We certainly settle quickly. We settle, we look for the first wave and try to find the rhythm and the rhythm might be different from jibe to jibe. Even after you jibe you just have to settle into that mode, get the boat going, get the crew weight up and just get the thing going, get the apparent wind forward. I think as soon as you have to start watching someone else or sailing to someone else’s mode then that’s when you’re losing VMG. If you sail out in a nice clear lane then you’re in good shape,” Stead said. 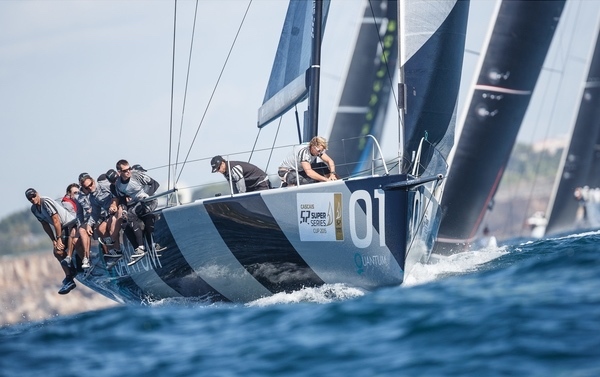 “We managed to lead from the start we’re really pleased with how it went today, our goal, ‘plan A’ was committee boat end first and early on to port. There was a bit more current relief on the right and it certainly seemed to work,” he added. Azzurra worked no less diligently, arguably risking a little less. Their strategy is simply to close out the season title and so the team’s main drivers are staying out of trouble, starting simply and relying more on their good boat speed and solid boat handling from a team which has remained largely unchanged over the course of the season. 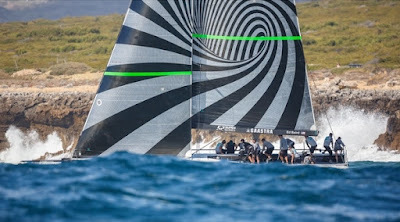 In fact only in Porto Cervo was one team member substituted due to a prior commitment. It is true to say then that the team line up which started in Valencia in May will be exactly the same as finish the season on Sunday. With just six to nine knots of NW’ly breeze still containing holes and small puffs of additional pressure Azzurra sailed the top third of the first beat well in the first race to round second behind Quantum Racing with Provezza third. All three gybe set and with the course relatively one sided then that was the order through the finish line. In the longer race Azzurra made sure of their second place when they outfoxed Vesper on the long downwind back from Cabo Raso, working the inside, inshore lane to get themselves into an attacking position before the wily Vasco Vascotto pressed home a clever move which got them up to second. 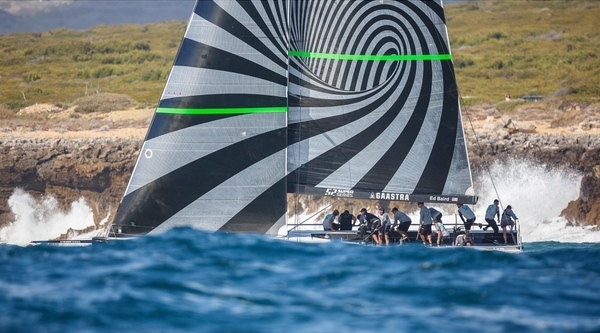 Vesper, with a 4,3 for today hold third place on the Cascais Cup podium with this morning’s leader Spookie dropping to fourth, ballasted down by two eighth places today. The battle for third overall for the 2015 season intensifies by the day. 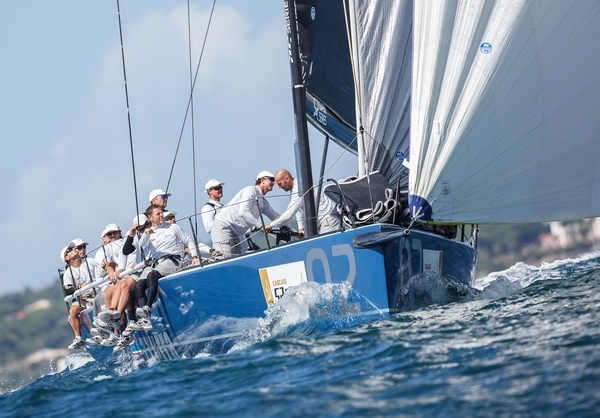 Bronenosec got themselves back into third after Race 3, but a penalty turn not long after the start line – punished for a port starboard crossing with Xio – annulled what was otherwise a strong opening to Race 4. Sled are in third overall but just three points up on the Russian team.